I was in Flight 1345 in 3704 BMTS. My TI's were SSgts Standifer, Bong, and Saenz. This was in Dec 1974-Jan 1975. I did a goofy imitation of Ed Sullivan if that rings a bell. I went through Security Police Tech School at Lackland including Camp Bullis. I was stationed at Mather AFB 320th SPS "B" Flight. My flight chiefs were TSGTS Bridal, Sykes, and Baxley. I currently live in Lomita Ca, a suburb of Los Angeles. I"m married with one son. 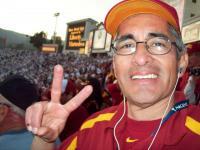 My interests are USC Trojans football, bowling, and running. Currently trying to set up a reunion of my old basic flight, 1345.